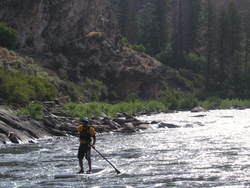 Middle Fork River Expeditions (http://www.idahorivers.com) is partnering with C4 Waterman and providing Stand Up Paddling on the Middle Fork of the Salmon River in Idaho. Middle Fork River Expeditions now has many options to explore this amazing river canyon, from Oar boats to Paddle rafts to Inflatable Kayaks and now Stand Up Surf Boards. Please join us next summer to try this amazing new sport on the Middle Fork! The Middle Fork of the Salmon River in Idaho is the premier wilderness float trip in the US and flows 100 miles of wild and scenic free-flowing river through the largest wilderness area in the US. The canyon is the second deepest in North America. Because of its remote location, human presence in the area was somewhat limited, leaving it in the condition we see today. The Middle Fork of the Salmon is unspoiled, remote and roadless so you can be sure you will "get away from it all". Simply put, it is the best river run in the West! Middle Fork River Expeditions, licensed and bonded outfitter, has run safe and well-managed river trips on the Middle Fork of the Salmon River in Idaho for 30 years. Trips are 4 and 6 days of exciting river rafting, wilderness camping, fine fishing, and adventure travel. Our equipment is specially designed for wilderness whitewater rafting, and offers mild and wild boat choices (oar boats, paddle boats, inflatable kayaks and Stand Up Surf Boards). Ask about special river trips with kayak instruction or wine and massage. Our river guides are seasoned professionals, licensed by the state of Idaho and First Aid Certified. They are expert river runners, magnificent cooks, great storytellers, and knowledgeable, helpful outdoorsmen. Check out our website for photos of Stand Up Paddling from our inaugural trip in 2008. Join Middle Fork River Expeditions for a magical wilderness river vacation learning how to Stand Up Paddle. Or bring your own board for the more experienced Stand Up Paddler.